Firefighters rescued three people from a fire started by an alleged hash lab. A firefighter and two residents were injured after an alleged home hash lab exploded yesterday afternoon. Humboldt Bay Firefighters responded to the 1200 block of Freshwater Road around 4 p.m. to find a “well-established fire” in the attic of a one-story home. Three people were rescued from the structure, and two of them were sent by ambulance to a local hospital. A firefighter sustained minor injuries in a fall and was treated and released at a local hospital. Sheriff’s Office deputies attempted to talk to a resident on the scene, according to a press release, but the resident’s attorney advised the person not to speak with police. When deputies visited the hospitalized victims, their attorney also arrived and told them not to speak with officials. The office will continue to investigate. At 1617 hours, on 11-19-15, Humboldt Bay Fire Engines 8115, 8113, 8112, Squad 8174, Battalion 8104 and Chief 8100 responded to a structure fire on the 1200 block of Freshwater Road. 911 calls were received describing heavy black smoke coming from the attic. The first unit to arrive stated smoke was coming from the attic at a single story wood framed residence. An ambulance was requested for a victim that had been inside the structure when the fire started. Multiple crews were assigned to the interior where they found a well-established fire in a large attic space. An additional engine was requested to the scene and a second alarm was struck to staff HBF stations Arcata fire and Loleta fire both send engines to assist. Three victims were located and two were transported by ambulance to a local hospital. The fire was extinguished after 30 minutes and crews remained on scene for 3 hours making sure the fire was completely out. Humboldt County Sheriff responded to investigate a suspected hash oil extraction operation. California Highway Patrol responded to provide traffic control. One fire fighter suffered minor injuries from a fall from a ladder. The firefighter was transported to a local hospital, treated and released. Damage estimate is $30,000. 18 firefighters responded. The cause and origin investigation will be conducted in the morning. Humboldt Bay Fire reminds all residents to ensure they have working smoke detectors in the living and sleeping areas of their houses and to have a fire exit plan. 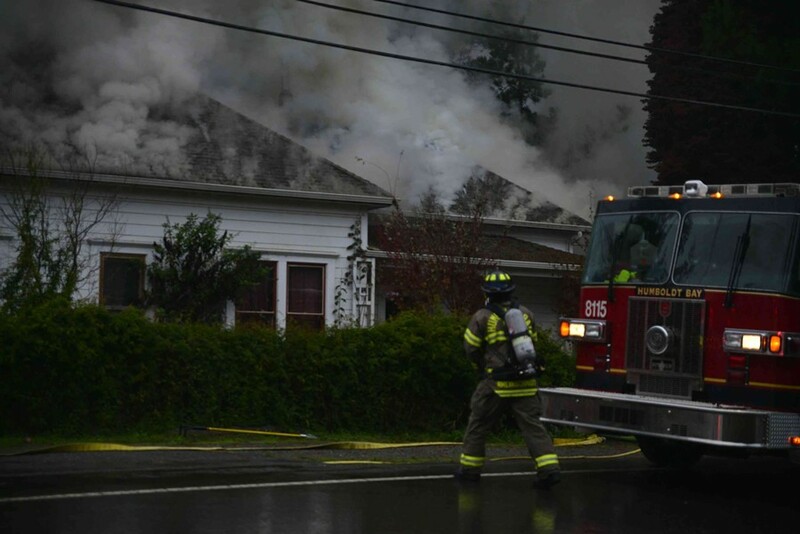 On Thursday, November 19, 2015 at approximately 4:05 p.m. the Humboldt County Sheriff’s Office received a call from Humboldt Bay Fire to respond to a suspicious residential fire on the 1200 block of Freshwater Rd, Eureka. Deputies responded and spoke with Humboldt Bay Fire’s Battalion Chief who stated he believed the fire was caused by a hash lab explosion from inside the residence. The Deputy spoke with one of the persons who was in the residence when the fire started but was interrupted by their attorney. The attorney advised the involved person not to speak with the Deputy in regards to this incident. The Deputy was informed of two additional subjects who were in the residence during the fire and they were now at a local hospital. The Deputy responded to the hospital and began questioning the involved party when their attorney appeared and advised them not to speak with the Deputy in regards to this incident as well. Due to the lack of cooperation with this incident this case has been forwarded to the Sheriff’s Office Criminal Investigation Division for further investigation.